Mutianyu is a section of the Great Wall of China located 70 km northeast of central Beijing. The Mutianyu section of the Great Wall is connected with Jiankou in the west and Lianhuachi in the east. 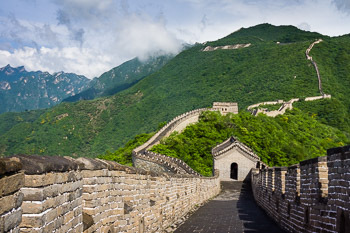 As one of the best-preserved parts of the Great Wall, the Mutianyu section of the Great Wall used to serve as the northern barrier defending the capital and the imperial tombs. It was first built in the mid-6th century. Prints available; click the image or click here for a larger preview.